Lawn And Garden Holes: What Is Digging Holes In My Yard? Size does matter. If you are experiencing holes in your yard, there are a variety of things that could be causing them. Animals, children at play, rotten roots, flooding and irrigation problems are the usual suspects. Small holes in yards are generally from insects, invertebrates or burrowing rodents. Larger holes have more catastrophic causes as a rule and the origin must be discovered and the issue repaired. Use a sleuthing process to answer, “What is digging holes in my yard?” Then learn about identifying holes and fixing the problem. Not only is size an important clue when identifying holes, but so is location. Holes throughout the lawn are usually sourced to small rodents, like voles or moles, or insects. 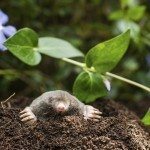 Mole holes are covered by a hill of earth, while a vole hole is not. Birds make holes in sod as they search for food and earthworms make small little holes the size of pencils to aerate the soil and provide air to their tunnels. Some wasps and other insects lay eggs in sod, which produces holes. It might be beneficial to excavate small holes in yards to see if there are eggs or if there is a tunnel. This will provide you with more information so you can decide what approach to take next. The home gardener seeking to find out what is digging holes in my yard may have to cast an eye to pets or children. This may seem obvious, but if you have a roving pooch in the neighborhood, it might be a digger. Children also find it fun to make tunnels and fort in dirt, which often requires excavation. Once these obvious causes have been eliminated, it is time to focus on site. If the problem isn’t holes throughout the lawn, but holes in the soil or garden, there are other possibilities. Wild animal activities create holes in the garden. Birds, squirrels and other animals dig in soil looking for insects or food they previously buried. Animals also burrow into soil and nest underground. 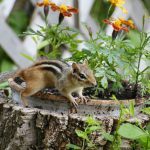 Areas near tree snags and roots that have holes could be the burrows of rats or chipmunks. Larger holes may host armadillos or even groundhogs, which leave holes a foot across. Watch in the early morning and evening for signs of these animals. Wet or boggy soils may be the home of crawfish, which leave 2- to 4-inch tall mud towers with a broad hole at the top. If you want them off your property, trapping or professional animal control services are likely your best option. Insect activity and life cycles are prevalent in soil and sod. Contemplate lawn and garden holes by season if you suspect insect invasions. Earthworms are most active in spring and when soils are moist. They leave a granular tower of soil around their 1-inch holes. Many other insects lay their eggs in soil and the larvae hatch in spring, leaving pinprick sized holes. Post winter, roots from trees may fail and cause cave ins. Diverted streams or other underground water can create holes. When you turn on your sprinkler system in spring, you may find a pipe has sprung a leak and will cause a boggy fissure. As you can see there are many possible causes for a hole in the landscape. Follow the clues and see where they lead.